Now, what do I mean by disguised? Check this out. 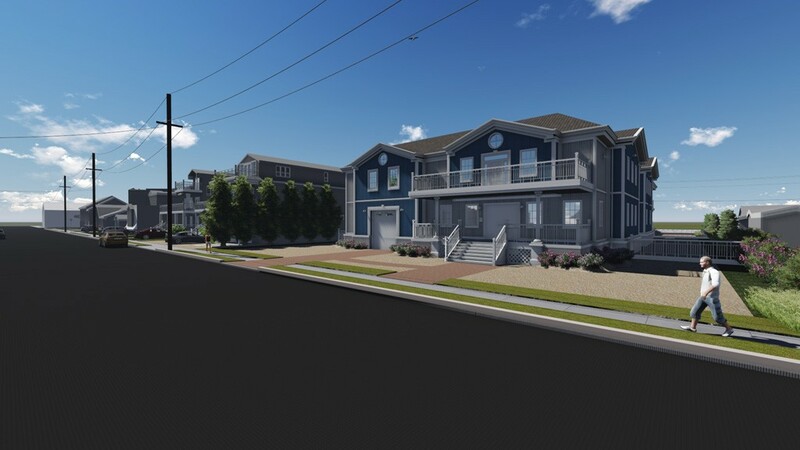 This a rendering of what the new Peerman electrical substation in Avalon, NJ will look like. How cool is that? A house!!! Not some giant, nasty looking, electrical, transformer filled, barbed wire nightmare. No. 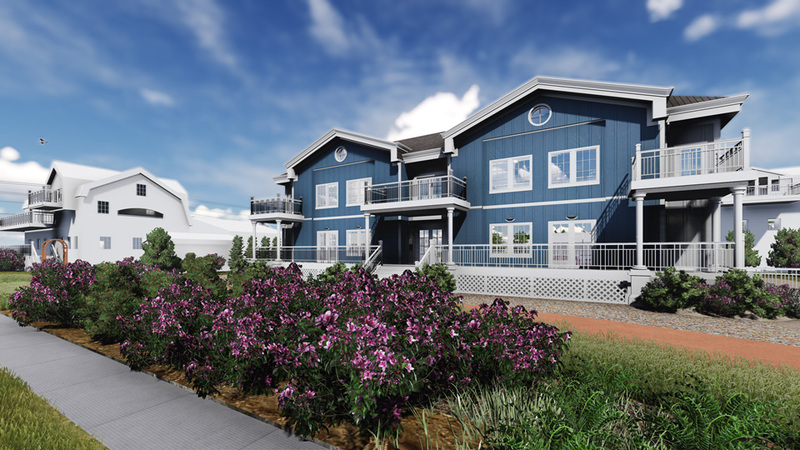 This is a working substation/house with a balcony, windows, a garage, landscaping and more. This might be common practice but it’s the first I’ve seen of it. 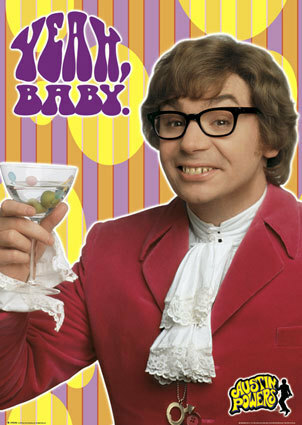 And I dig it, baby. So that leads us to just what is Superior Scaffold doing on this project? Well, take a look at the job site. This is a far cry from the glory of the finished renderings – but in due time, my friends, due time. 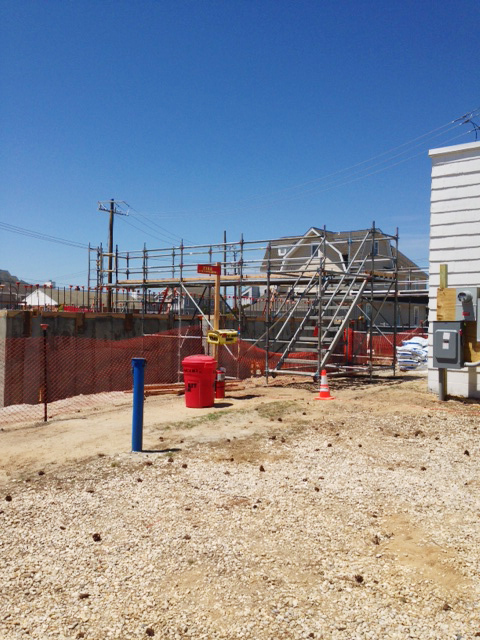 They are currently constructing the new building and we were called in to erect a scaffold bridge from the old substation, up and over, into the new one. 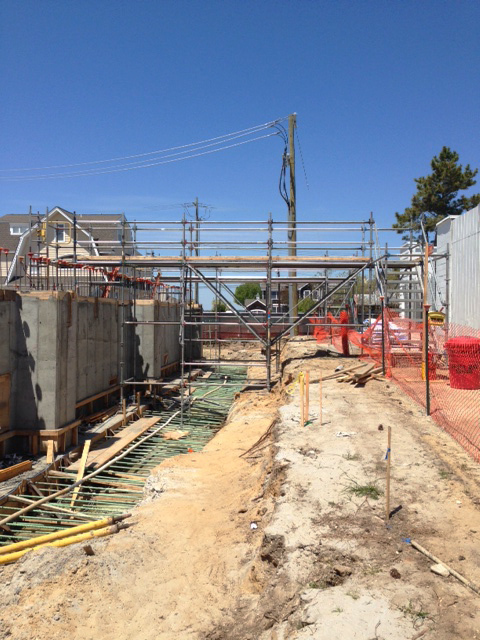 Crews working on this Atlantic City Electric job needed a way to get down into the new building safely. If you look carefully at this photo you can see the trench, rebar, cement, dirt, and other obstacles that stood in their way. We erected a scaffold bridge using system scaffolding that’s 4’ wide X 31’ long X 13’ high. It also incorporates a stair tower, deck, plank, guard rails, ladder and more. The surrounding upscale residential area has grown substantially in the last several years and has caused the existing substation and transmission lines serving this area to be near their load capacity. 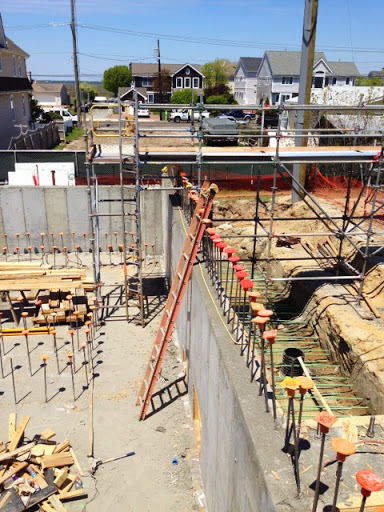 This is a substation and we are subcontractor for Ray Angelini, Inc. who is installing the conduit in the new structure. The existing 23kV substation must be re-built at 69kV to accommodate this load growth and to allow for continued growth in the area. The new substation will benefit the entire 7-mile Island and areas surrounding the causeways to the mainland. This entry was posted on Tuesday, May 19th, 2015 at 7:27 am	and is filed under News & Updates, Rentals, System. You can follow any responses to this entry through the RSS 2.0 feed. Both comments and pings are currently closed.